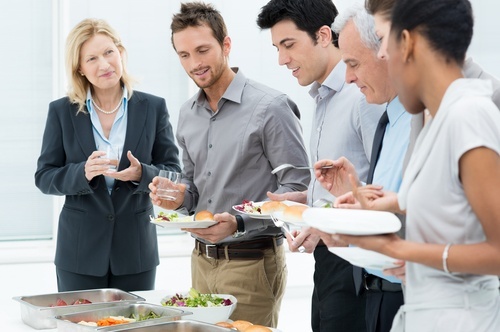 How can organizing a wellness lunch and learn help promote healthy lifestyles in your office? By bringing you and your coworkers together to learn important health information, discuss ideas, and brainstorm office wellness programs and initiatives. If you’re reading this article, that means you’re sitting at a computer. Whether at home or at the office, most Americans spend a significant portion of their days on the computer; in fact, an average of 8.5 hours is spent daily in front of screens. How much time do you spend staring at screens each day? What about other sedentary activities? So what’s a corporate worker to do? If you’re spending half of your waking hours (or more!) at the office, then the solutions to a sedentary lifestyle must be learned and practiced at work, as well as at home. Maybe it’s time to bring your office together for a little corporate wellness lunch and learn, yes? heads together. That’s why a corporate wellness lunch and learn is such an effective event. Effective and enjoyable! It’s a chance for you and all your coworkers to dust off your creative minds and start thinking about what corporate wellness programs can do to transform your office culture into one that’s intentional about promoting healthy lifestyles. And it’s a chance to be informed about pertinent health-related topics. Every office is different–and it will be up to you and your coworkers to determine what corporate wellness programs will work best and what material should be taught. That being said, here are some tips for holding a corporate wellness lunch to promote wellness. Sometimes, healthy living can be a bit too broad of a topic for productive education and discussions. Pick a particular topic prior to your wellness lunch and learn to learn about and discuss. Your wellness lunch and learn topics could include smoking cessation, aerobic exercise, or sugar intake. Make sure your meeting isn’t all lunch and no learn–arrange for someone to design a presentation on the topic at hand. Before the meeting, encourage everyone to bring to the table one idea that could make your office a healthier place. It’s a great, easy way to get everyone involved and invested. Organize an incentive program to encourage everyone to live healthier lifestyles. It could be a weight loss competition or an office walk-a-thon–the possibilities are endless! Practice what you preach. Put the wellness in your event by encouraging everyone to bring a healthy lunch–or have a healthy food potluck! Trust me, you won’t run out of wellness lunch and learn ideas or topics to talk about once you start brainstorming together. Those are just a few helpful hints on organizing a corporate wellness lunch and learn. Brainstorm your next event to promote office wellness–and, remember, Wellworks For You is here to help you implement your comprehensive corporate wellness plans. We are even available to speak at your next lunch and learn presentation! Contact us today for helpful advice and stellar services.